Bold Stuff I’ve Never Used! I wanted to make a “how’s it going” card for a friend (the one that got married a few posts back…) who’s recently moved to a new place and is also new to this whole Pastor’s wife thing. When I saw the Simon Says Stamp Boldly Go Into Stamptember Challenge, I thought some bright ice cream scoops would be a perfect way to go! So, I am very excited to be double dipping (HA! That pun was NOT intended) with this card at both Simon Says Stamp AND djkardkreations! 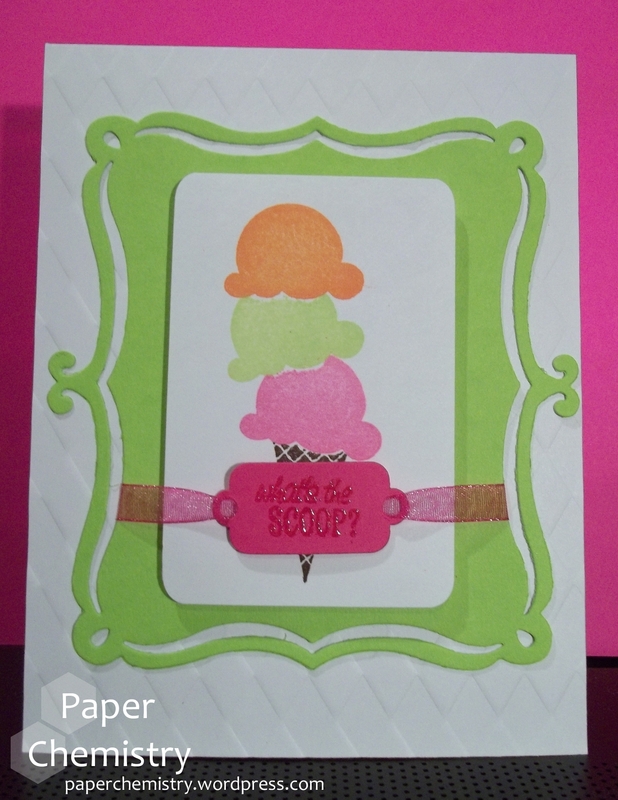 The ice cream stamps are from Stampin’ Up (Sweet Scoops, retired), and the sentiment is from the Fiskars Cupcakes and More set. The Harlequin embossing plate is also by Stampin’ Up (retired). The swirly frame is from Sizzix (and seems to also be retired) and I hadn’t used it before, either. The tag die is from Cuttlebug’s Tiny Tags set, and considering I had to cut the package open, I apparently had never used it before either! Thanks for the opportunities to enter this card!